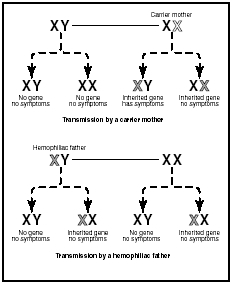 Chart showing how hemophilia is transmitted on the X chromosome. However, some 30 percent of hemophilia cases are caused by random genetic mutation. of hemophiliacs contracting a fatal slow virus infection of the brain (Creutzfeldt-Jakob disease) from blood products. However, more sensitive testing techniques have been developed and as of 2004 were employed by the companies producing pooled precipitates from human plasma. These improved methods of donor testing, as well as methods of inactivating viruses present in donated blood, have greatly lowered the risk of infection. See also Coagulation disorders . "Hemostatis and Coagulation." The Merck Manual Online , 2003. Available online at http://www.merckcom/pubs/mmanual/section11/chapter131.131c.htm (accessed October, 22, 2004). March of Dimes. Available online at http://www.modimes.org (accessed October 22, 2004).